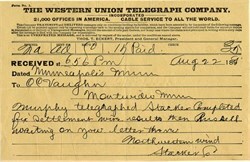 Historic telegram from the Western Union Telegraph Company dated in the 1890's. This vintage document was printed by the Western Union Telegraph Company. This item is over 110 years old.